Frozen characters shrunken in stature, twice the cuteness! Your favorite Frozen characters in Mystery Minis form! Anna, Elsa, Olaf, Sven, and more! These are some of the coolest Mystery Minis you’ll need for your collection! 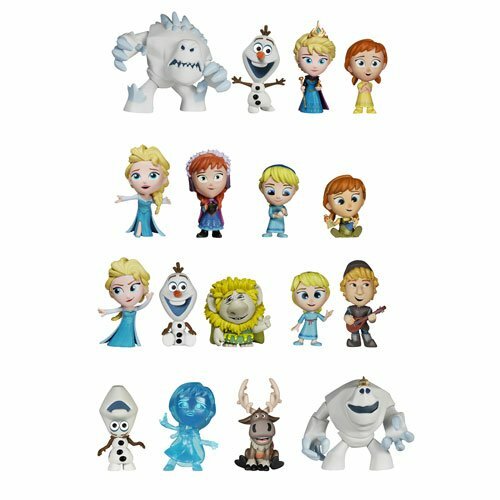 This collection of Disney Frozen Mystery Minis features all your favorite characters shrunken down in stature to 2 1/2-inches tall with adorable stylized designs! This Disney Frozen Mystery Minis Mini-Figure Random 4-Pack contains 4 individually blind packaged mini-figures. Ages 3 and up. This Disney Frozen Mystery Mini Vinyl Figure Random 4-Pack contains 4 individually blind-packaged mini-figures that may include (subject to change): Elsa Coronation Elsa Young Elsa Anna Young Anna Coronation Anna Olaf Sven Marshmallow Please note: Item selection is random. Items are in blind packaging. We cannot accept requests for specific items, nor can we accept returns on opened items. You will receive duplicates.